Rod Dibble was The Alley's longstanding cocktail pianist extraordinaire. Rod Dibble, the longtime beloved pianist at The Alley, has died, according to a Facebook post today by the Grand Avenue bar. Dibble was an Oakland institution. 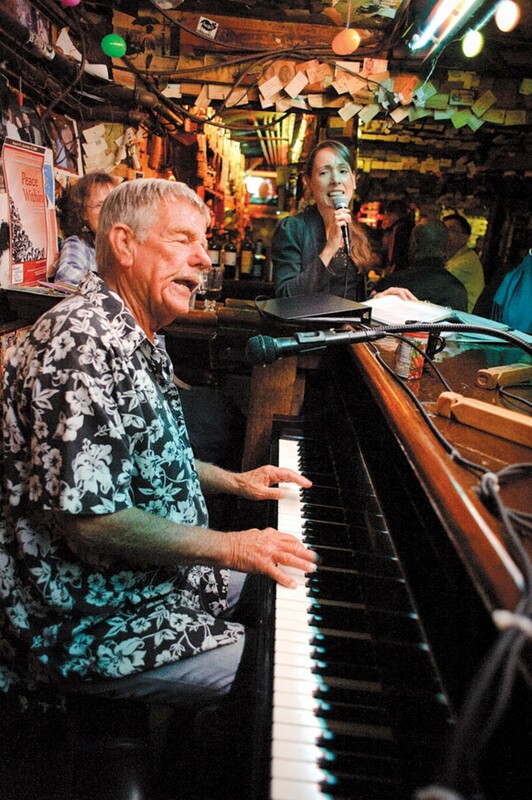 He began playing at the dive bar in 1960, and his encyclopedic knowledge of music — he had more than 4,000 songs in his repertoire — coupled with his dedication to his craft made his nightly appearances at the piano bar a spirited, community affair. In awarding The Alley with a Best Of award for Best Retro Karaoke Bar in 2011, we wrote about Dibble: "He's adept not only at guiding the inexperienced past a variety of vocal landmines, he's a marvelous accompanist and an encouraging audience to boot." It is with great sadness that we announce the passing of Rod Dibble - the pianist for The Alley. Rod passed away peacefully on December 18, 2017. No plans for a memorial are known at this time. Please be respectful to Linda and his family at this time. Rod Dibble was and will always be an integral part of The Alley. He kept The Alley, as well as the Great American Songbook alive by playing night-after-night, song-after-song, with singer-after-singer for the better part of 50 plus years. By all accounts, he literally wore out 10 pianos in the process. He kept The Alley going and virtually unchanged throughout the decades keeping its unique character and grit intact. While the neighborhood around it changed, The Alley and Rod remained a constant with the walls layered and caked with its history and a repertoire of songs frozen in time. The passing of Rod may represent yet another end-of-an-era demarcation. Yet, we feel compelled to keep this place and these songs alive to pay tribute to the man who dedicated his life to keeping these songs alive, and also to keep the community and spirit he built alive. The beauty about Rod and this community is the dedication to a time when songs were melodic as well as rhythmic and their meaning transcend and endure regardless of generation. While musicals tastes have moved through Rock 'n Roll, Disco, R&B, 80s pop, and hip-hop, Rod somehow put a whole generation of songs and the piano bar concept into a time-capsule by creating a community of singers to keep it going. This community is special, these songs are special, The Alley is special, and Rod Dibble was the man that made all this special. Thank you Rod! From The Alley Family and his community, our hearts and thoughts go out to Linda, Rod's wife, his family, close friends, regulars, and his fans all over the world. Rod - may you play on, and on, and on.